A blink and you miss an entire month! Is this good or bad... I don't know. What I know is that, I have no recollection of the month of May 2013. The month just wheezed past and I realized it was June already. A lot was happening in too short a time, but that's another blog post. It was Lil Sid fourth Birthday on 26th May and it was a very close private affair with only very close friends participating in the revelry. When I had asked Sid what he wanted for his birthday, he said he wanted a "pretty cake with lots of MnMs". And I obliged. I am not much of a baker and my frosting/icing skill is average or even below. 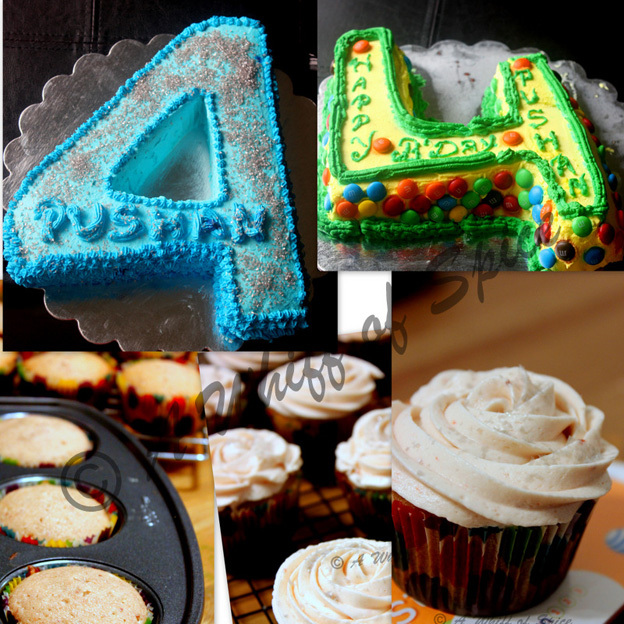 But I dared this time to make two Mommy-made cakes for Lil Sid and some Mommy-made cupcakes for his friends in school. The only thing that I remember of the amnesic month of May, is that I had cooked a lot and in pretty copious quantity. No, I have not started a catering business. These were for the numerous pot luck parties we attended. Midst all the spicy, oily and yummy stuff that I cooked, I also made a surprising delightful and refreshing salad called the Apple and Fennel Salad. And this is what I am going to share with you all today. Fennel, the vegetable, like a lot of other veggies was introduced to me after I moved to the US. Prior to that I only knew of Fennel seeds and Fennel powder. Fennel seeds is a popular mouth-freshener and digestive in India and is served in all restaurants post hearty meals. Mom used to temper her Biulir dal (Urad Dal or Husked Split Black Gram) with fennel seeds. Grandmom used to consume Fennel water (soak a tablespoon of fennel seeds in a glass of water, overnight and consume the water in the morning empty stomach) every morning during the summer months to cool down her system. After my friend Karuna Raina, introduced my to Kashmiri Cuisine, I had started to spice up my mutton and chicken curry with lots of fennel powder. And I loved Mouri Logenze or sugar candy coated fennel seeds packed in fancy, cheap plastic containers and it used to be such a craze among my cousins. I had quite a stellar collection of empty containers myself. I doubt if kids today have access to such simple joys anymore. Well, that's about everything Fennel(y) in my life (and my cooking) till it reappeared in a veggie form. I had seen this very pretty veggie every time I went to Jungle Jim's, my farmers market. It usually next to all the dark green leafy bundles, looking very elegant in all is bushy fronds and in sharp contrast with its pale demeanor. I had passed it, pausing momentarily to admire its beauty and then moved on. What if I don't like its taste and it ends up in the garbage? They are not particularly inexpensive, are they? I had seen a beautiful recipe on Purple Foodie. But I was still skeptical. And then finally, a couple of weeks ago, they went on sale. $1.25 a bunch. I can risk that, I said to myself as I helped one to my cart. Sam gave a queer look and I returned a "you-don't-have-to-eat-its for-me" stare. Next Monday, as I threw my ingredients into the salad bowl my inhibition started to ebb away. I had found a new love. I said that to my self as I munched on and watched the rain lashing away on my window pane. The salad is crunchy, nutty and sweet. Sweet, not in a dessert kinda way, but in good sweet way! It is said that fennel has a mild licorice flavor. I have no idea what a "mild licorice flavor" is. For me the thinly sliced fennel bulb tasted like... Fennel... the seed. The same sweetish flavor that you get from munching fennel seed after your meals. Only not in an overpowering way, but in a mild, pleasant way. This time I had this salad by itself for lunch. But I would very much like to have this sweet, crunchy salad as a side to some delicious grilled pork chops. For all those who are in the US or in places Fennel bulbs are abundantly available and reasonably priced, and have not tried this wonderful veggie, I urge you all to try it at least once. You'll not regret it. 1. All the recipe of Apple and Fennel salad that I had seen, had one thing in common. They all emphasized on the fact that the the fennel and the apple should be sliced as thinly as possible. And I can understand why. If you own a mandolin slicer, congrats! use that. If not, hone your knife skills and slice them as thinly as you can. 2. Toss the almonds (or walnuts), cranberries and give a good toss. 3. In a separate bowl, whisk all the ingredients under dressing and pour over the salad and give a good toss. 4. Plate the salad and add the crumbled goat cheese and garnish with chopped fennel fronds. Fennel is very low in Cholesterol. It is also a good source of Niacin, Calcium, Iron, Magnesium, Phosphorus and Copper, and a very good source of Dietary Fiber, Vitamin C, Folate, Potassium and Manganese.